Welcome back, it's Day 2 of our January Release Inspiration Hops! 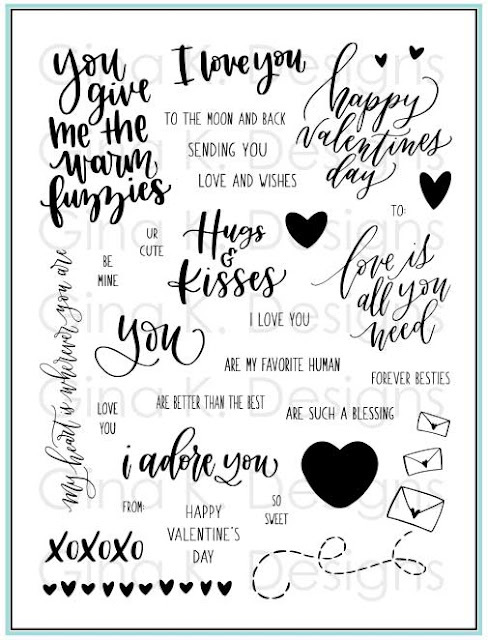 Today we are sharing ideas for Beth Silaika's All Star and Emily Loggans' Love is All You Need stamp sets. Be sure to comment on the blogs as you hop through, Gina will select a winner randomly from the comments on Friday for a $50 gift certificate to the store for some crafty shopping. You are not required to comment on every blog to enter, but the more comments you leave, the more chances you have to win. Let's get to it! Here is sample I made with Beth's set All Star and my Open Book set. This fun, colorful star layout reminds me not just of picture books, but of old my sticker collection! (Lots of Lisa Frank and Mrs. Grossman, remember those??) This card just makes me feel like a kid again, I always had my nose in a book. Honestly I don't read quite as often now because if I'm going to sit down I need to be crafting, but I'll always love books for the stories that have been read to me, the joy they've brought me and the places they've taken me. I stamped the different stars in Gina K. Sea Glass, Red Velvet and the line art ones in Jet Black Amalgam, then colored them with alcohol markers. I had a LARGE bookmark collection as a kid, but dog-eared my pages like this, too (unless they were library books). 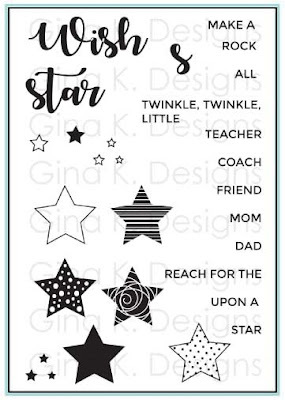 I love the fonts Beth chose and how these different greetings you can customize fill up the card (or the page in this case) Star stamps are so versatile for holidays, gift wrap, when you need just a bit of something on your card even if it isn't star-themed. I cut it all out and popped it up for dimension. Base is Pure Luxury Warm Cocoa, to represent a desk. I don't have Emily's set or the incentive yet, but they are on the way! I look forward to using both of them very much and will post samples when I do. Her writing is so beautiful and handwritten sentiments really add a personal touch to your projects. Here are both sets to see what each include. Lovely Words-free with purchase of $75 or more! See and shop ALL the new products HERE. Let's see what the rest of the design team has today! Your next stop is Mindy Eggen, but here is the full list if you are just joining in! Melanie-you are here! Thanks for visiting and your comment! Your new stamp set is awesome. I also really like the All Star set featured here. Great card and ideas as always. Love the combination of the stars and the book. Such lovely stamps, I really love the book and just how many different looks you can get with it. TFS! Your card is stunning, love how you used the open book with the star set! Great design with the open book and stars. Love the stars and the versatility of the stamp sets working together! Your cards are always beautiful and I love watching your videos. Thank you. I appreciate how all the new stamp sets can be used with such versatility with all the other stamp sets. Thanks for showing how this set can be paired with others to make a super card. LOVE how you incorporated different stamp sets...so versatile!! What a great idea for a card! I LOVE the book theme....and PINOCCHIO. I like the opened book idea. Such a neat idea. The stars with the book ... brilliant! Love it! Love the book, Melanie! Thanks for the inspiration! The All Star is such a versatile set and the way you used it with the open book is fabulous. Thanks for sharing. I love how everything works with your book stamps! Love the card Thanks for sharing. Super cute card. Thanks for sharing your talents with us. Fantastic card. I love those stars. I've been away from stamping for quite a while and am getting restarted again and looking forward to using many of your stamps that I had purchased in the past. Looking forward to seeing more of what you come up with for new stamps. 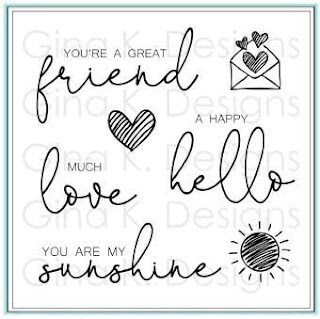 I LOVE how you incorporated your Open Book stamp along with these other new stamps! As always, you're so inspirational! Great cards. Love to combine different sets together. Love how you combined the stamp sets! Thanks for sharing and all your inspiration. Fantastic card Melanie! I can't wait to use these new sets. Wonderful! Thanks for sharing the new stamp sets. 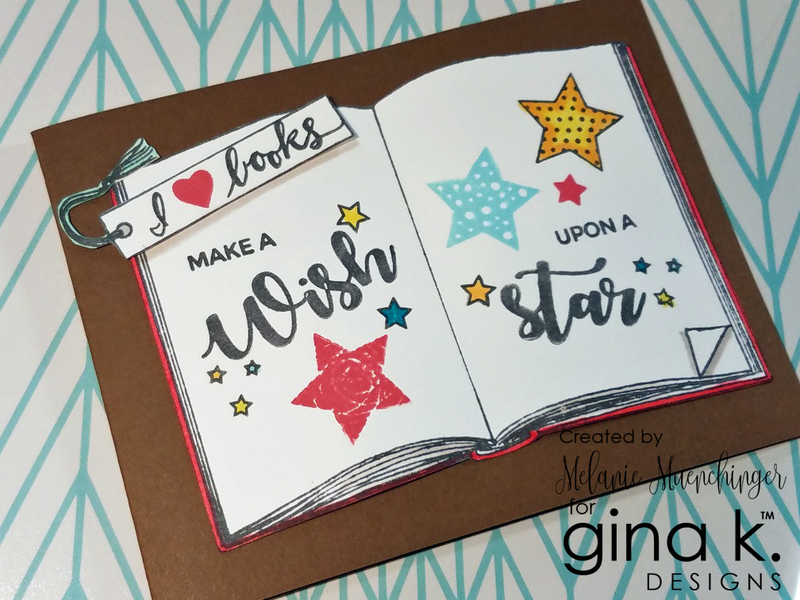 Love how you combined the book stamp I fell in love with yesterday with those fun stars. Wonderful card. Clever putting the new words in the pages of the book image. Wonderful card, Melanie. I like how you dog-eared the page in the book. What a fun, fun card!!!!! It truly made me smile! The book has so much dimension. This book stamp works wonderful for so many things! <3 Love your card. Pretty card! I love the way you combined these sets! The open book stamp is so unique and wonderfully creative. Love your card and how you combined all 3 sets in one card - fantastic! You really do make some interesting and creative designs. Always ensures that I look at all my stamps to sometimes combine them with other sets. Great card! I can't wait to get my hands on that. "Open Book" stamp set!! Love this card. the open book is so great for all stamps in our collection. Your cards are simply beautiful! Awesome job!! Thank you for sharing!! The book is a great idea. The book is awesome! Looking forward to your other samples! Thanks for sharing! this book set is sooo awesome!!! Loving all the new release!! Love the way u used the stars with the book. Loved how you made a journal page of the stars. Thanks for the ideas. Such a wonderful card. Love how you use both stamp sets. Melanie, It is a cute idea combining the two stamp sets. Still waiting for mine to get here. Love using the stars on your wonderful book. Great design. Thank you for sharing your beautiful card. This release is so fun! I think you are the first person to use the triangle to show the turned page. I like that added extra. Cute idea to use the stars with the book stamp. Yes, that's what I put it in tgere for! Drawn to fit top and bottom of both pages. I'll show in a video how to shade it! Love how you incorporated the Open Book set with the All Star set...great card design! Love that you used both...simply beautiful. Really cute idea using the book stamp and stars and love the turn page look. Nice! Great pairing of the book and stars! Delightful! So fun and cute! Wonderful combination of the book with the stars! Thanks so much for sharing and inspiring! That book stamp is so innovative! Great inspiration...thanks for sharing. What wonderful and diverse ways to use this classic new book stamp. Your cards are very creative and fun. Thanks! Fantastic card! I love the combination of the sets! Stars are like hearts...you can't go wrong. Great design using them with your Open Book stamp! I love the way you made it look like a sticker book! Love the stars combined with your book set. I Love the new stamp sets and card Melanie!